Unique 14-karat gold badge awarded to state motor officer Thornton Edwards for his heroic actions that saved untold numbers of Santa Paula residents during the St. Francis Dam Disaster of March 1928. 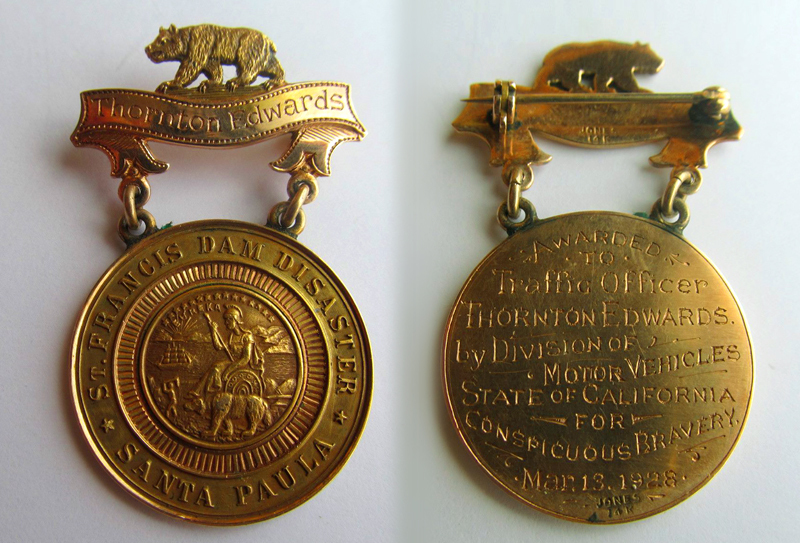 Front of medal reads: Thornton Edwards (engraved on gold ribbon) / St. Francis Dam Disaster * Santa Paula * (raised lettering, surrounding the seal of the state of California). Back reads (engraved): Awarded / to / Traffic Officer / Thornton Edwards. / by Division of Motor Vehicles / State of California / for / Conspicuous Bravery / Mar. 13, 1928. The St. Francis Dam broke at three minutes before midnight on the night of March 12, 1928, but the floodwaters didn't hit Santa Paula until the wee hours of the 13th. Edwards and another officer went door-to-door (actually to every other door), alerting people to the coming flood and advising them to get to higher ground. The Division of Motor Vehicles is the equivalent of today's Department of Motor Vehicles, and state traffic officers were the equivalent of today's California Highway Patrol. The DMV started as the Department of Motor Vehicles under the 1915 Vehicle Act but was absorbed in 1921 into the Department of Finance, at which time it was reduced to a division. Under the 1923 Vehicle Act, the division was authorized to hire traffic officers to enforce the act. Thus was Edwards employed during the St. Francis Dam disaster. The following year, in 1929, the division was transfered to the Department of Public Works (a Caltrans predecessor); in 1931 the DMV once again became a department unto its own, and so it would remain. Its code enforcement officers became a separate department — the CHP — in 1947. The back of both the gold (metal) ribbon and the medal portion of the badge are engraved with the maker's mark, "Jones 14K," probably indicating Ed Jones Co., a maker of police badges in Oakland, Calif., since 1898. At this writing (2014), the badge was recently purchased in an online auction by Terry Foley of Ventura. Ed Jones, a descendent of the early California Castro family, hall-marked badges under his own name in 1898 and possibly even earlier. Like many entrepreneurial spirits, Jones learned the engraving craft from his employer (the J.C. Irvine company of San Francisco) then ventured out on his own. It took many years, however, before he made that big leap into self-sufficiency. Irvine's was a successful engraving concern involved in the manufacture of badges, emblems, buckles and saddle silver. For over a decade Jones used an outbuilding on his mother's property at 853 40th St in Oakland as his covert base of operations, secretly competing with his employer, relying on the security of a regular paycheck. A shed in his mother's back yard housed the one-man operation in evenings and on weekends while he continued to punch a clock at Irvine's during the day. The great fire and earthquake of San Francisco in 1906 (8.25 Richter) totaled the Irvine's facility. Whether Jones deemed the event a fortuitous competitive advantage, (not having to rebuild like Irvines), or that it was simply an unexpected chaotic event breaking his well-entrenched pattern of existence, Ed Jones formally established himself in business as a general engraver in 1906. In 1910 he established a storefront and shop at 906 Broadway in Oakland. By 1923, Ed Jones and Company had outgrown the Broadway space and (again with the help of his mother) purchased larger quarters a few block away at 1017 Franklin Street. Ed Jones operated his business in this space until his death in 1949. In a 1939 article about the Ed Jones Company, Jones is described as being liked by businessmen for his aggressiveness and ability to perform to the standards set by himself. His acumen as a shrewd businessman is evidenced by the delivery of 500-600 pounds of brass, long after his death, by his niece. She stated that during W.W.II (when brass was to be turned in for the war effort) her uncle had hoarded the metal and hidden it at her house so he could maintain his business. For some unknown reason he had not picked up the brass after the war, having possibly forgotten about its existence. Outside of his business he was an avid outdoors man, spending his leisure time in the pursuit of fish and game. Many of his trophies were mounted on the walls of his office and shop. Hand drawn catalog designs reflect this interest with the outdoors, including badge designs for FOREST RANGER, GAME KEEPER and even a badge titled ED JONES, GAME WARDEN. In a final story, Ed Jones was rumored to have stashed coin money in water pipes and his hunting trophies. On his death it is reported that the workman tore up many of the walls and trophies looking for his hidden treasure. It is unknown what, if anything, was found. Upon Jones death in 1949 the trustee of Jones will, Frank Stagnaro, assumed operation of the business. A short time thereafter Stagnaro purchased the business out of probate and operated it until 1966 when he sold it to Chester Stegman. By the 60's, Stagnaro's other interests and involvement with the Masons was leaving little time or attention for The Ed Jones Company. Stegman learned the badge craft from his father Chris Stegman, then owner of Irvine and Jachens Badge company in San Francisco. (This is the same Irvines where Ed Jones got his start.) Having worked there for many years with his 2 brothers and father, Chester was ready for a change. While working at Irvines, Chester relates hearing how the old timers at the company still had hard feelings about Ed Jones double crossing Irvine by starting his own company and taking some of the East Bay customers. Chester decided he would look for work at a related engraving business. The Ed Jones Co. was as good a place to inquire as any. He called on Frank Stagnaro asking if he had a job opening. Stagnaro replied, "I won't hire you, but I would be willing to sell you the business." Chester went home with a heavy decision, consulting his wife and trusted uncle, Herman Stegman (his father's brother). With help from his uncle, Chester purchased the Ed Jones Company in November of 1966. In 1971, the company again outgrew its space and moved to 537 16th Street in Oakland, and then to its current Berkeley location in 1993. For over 30 years, Chester Stegman operated the business and remained involved with managing all aspects of its operations. Chester's role at the helm maintained the reputation of quality above all else, a mantra passed along to him by his father and also believed by Ed Jones. A 1930 catalog statement by Jones, reflects the heritage that Chester maintained for over three decades: "We are leading badge makers on the pacific coast, gaining our reputation by A1 workmanship and material. The finish of our product represents the utmost in progress towards higher standards of quality, utility and durability. Through this time, Ed Jones competitors were being forced by agency purchasing departments to sacrifice quality for a less expensive product. Shortcuts to reduce labor intensive processes of silver soldering, enameling, polishing and finishing were devised to lower the cost and compete on a low-bid-wins basis. Chester made a conscious decision to maintain the standards for which the company was known. There will always be customers who recognize the premium Ed Jones quality product. Chester's eldest daughter, Elisabeth Stegman Rusca and her husband Ric are carrying on this tradition. In 1998, they took the helm of the Ed Jones Co. and will carry on the tradition and heritage another generation. Chester is still active in the business though now spends more time with his grandchildren. Like Chester, Elisabeth learned the business from her father and is proud of the company's heritage. Ric and Elisabeth continue the premium badge manufacturing methods with improved delivery systems and are commited to their product and customers for the next generations of law enforcement and fire departments. This company is as much about badges as it is about history. HB2801: 19200 dpi jpeg from 2 digital images by Terry Foley, courtesy of J. David Rogers.